I race because when you complete a race, you feel you can do anything, in all facets of your life. It’s a real confidence booster. Also, four years ago my family and I were in a serious car accident that left me with 13 broken bones and a serious concussion. When I was in physical therapy five days a week for six months, triathlons were a fabulous goal to work towards. I didn’t want to just come back, I wanted to come back STRONG. Where do you want to take your racing? In 2007 I completed a half Ironman that I was woefully unprepared for. 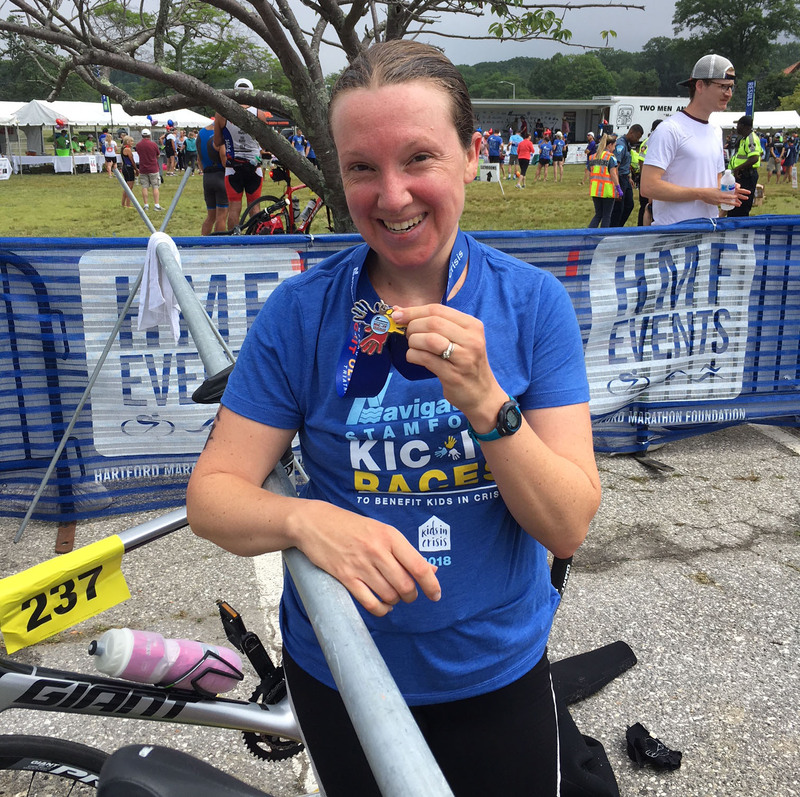 I cramped on the bike, saw black spots while running, and felt just absolutely awful after. I’d love to build up my triathlon strength to a point where I could successfully complete a half again. How has working with Coach Clare changed your training and approach to racing? I can’t sing Coach Clare’s praises enough. There’s no doubt that I was training wrong in every which way until I met Coach. I was training harder, not smarter. I was inconsistent. I wasn’t doing exercises to support my joints. I ate weird when racing, including one disastrous incident where I ate a fake-sugar protein bar for the first time while racing. I was also a little burned out on my repetitive training exercises. And most importantly, I wasn’t getting any better. Coach Clare had me set goals. She understands my time limitations due to being an Executive Director and having small children. She took into account the sore parts of my body. And much more. Coach Clare created a training plan for me that works with my schedule, is actually really fun (well, mostly! ), keeps me motivated, has made me strong, and most importantly, has already helped me improve my race times. Really, what was I doing before Coach Clare? Want to learn more about becoming a CZC athlete?